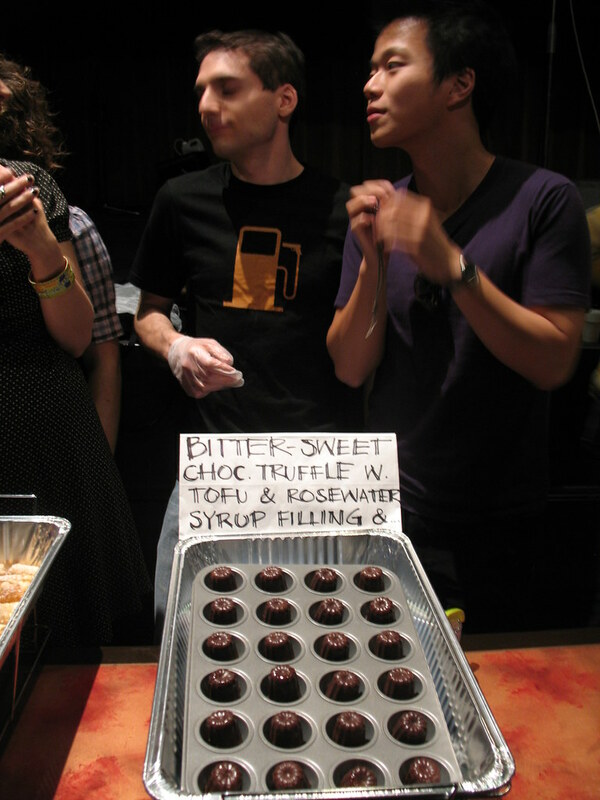 Nobody was to-fooled by what was in their food Sunday at the Highline Ballroom: it was the first-ever Tofu Takedown. As an antidote to last month’s Bacon Takedown, Matt Timms turned his popular Takedown series upside-down by taking on that versatile and very un-carnivoric delight. Tofu, in all forms, firmnesses and flavors found their way into the contestants’ 17 unique dishes. And as one half of the lucky (“celebrity“?) judging squad (the other half being my half-Asian sista, Akiko), I got a taste of them all. 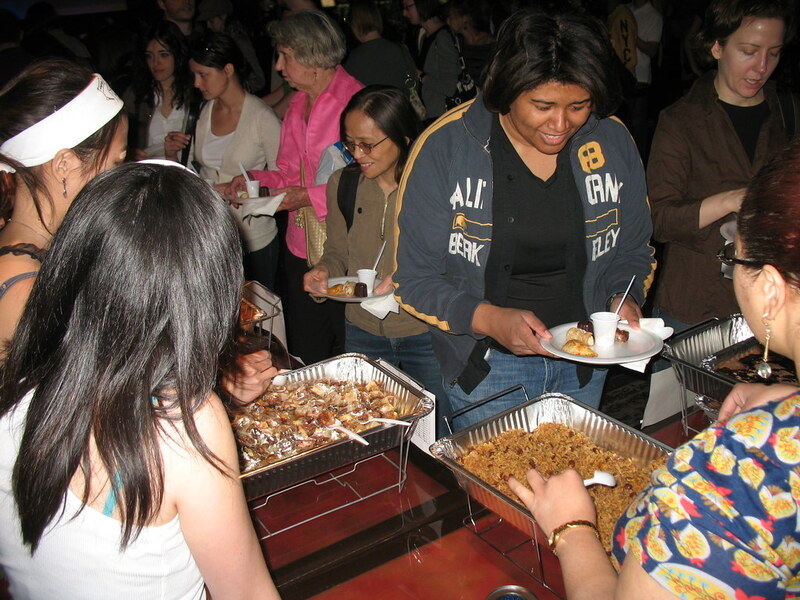 Vegetarian entries often involving tofu have been brought to just about every Chili Takedown I’ve been to — all the way back to the beginning, when a seitan version won first place with the judges. But, it had never really been given its proper spotlight. Contestants in the Tofu Takedown didn’t even have to eliminate meat from their recipes entirely, but all of them ultimately did. No meat was there to be eaten at this vegetarian-friendly fete. But alas, it was not a vegan’s paradise, as many chefs used dairy in various forms — a whopping 14 out of the 17 contestants chose to make sweets! I hope everyone was ready for early dessert when the door was opened to the discotheque-looking bar at 4:30pm. 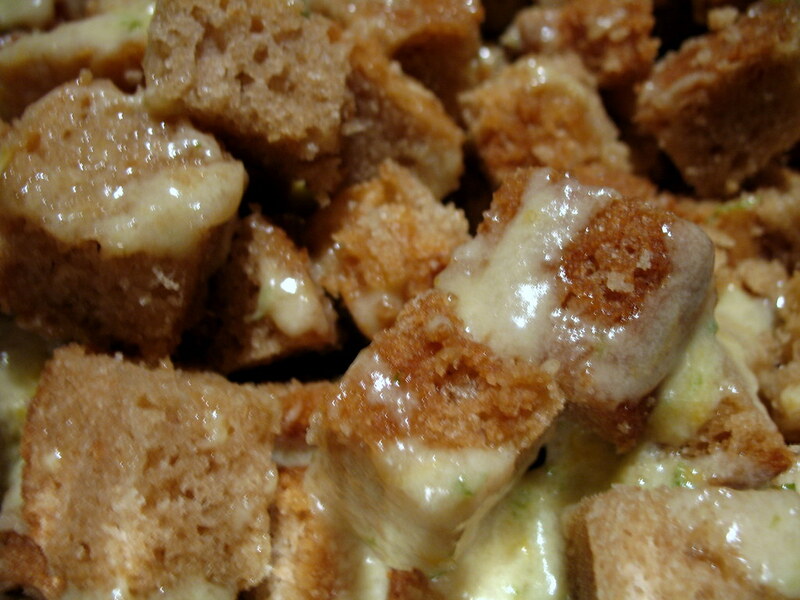 Perhaps it only makes sense that tofu inspired the sweet tooth to such an extent, since at previous cook-offs for bacon and pork, the most savory things I can think of, desserts made a big showing there, too. With some of these entries, I would never have been able to tell they had tofu on my own. In some of them, I truly tasted and appreciated the subtle flavor of the soybean curd itself. Both feats were awarded, in the end. I enjoyed a deliciously creamy, key lime pie-y “Tofu Lemon Cup” made by Kathy Patalski, so for one of the judges’ special awards, we named it “Best Disguise of Tofu.” It was also vegan and 100% organic. Akiko and I really enjoyed the fluffy texture and flavor of a “Mr. T. Tiramisu” made by Diane Spoto, so awarded it “Best Texture.” Eve Dilworth’s salty caramel ice cream topped with pear slices was an exemplary twist on a current food fad (salty caramel), and I can’t believe how creamy it was even though it was made with mostly tofu! So that one was given “Best Interpretation of Food Trends.” My girl Karol Lu (of guac fame, among many other cook-off wins, and co-host of the upcoming Risotto Challenge) made the best take on General Tso’s Chicken I’d ever tasted, only it was with tofu instead of chicken, and called “General Lu’s Tofu.” That dish won “Best Interpretation of a Classic Dish.” The team of Henry Chan and David Gottesman crafted beautiful dark chocolate truffles filled with a rosewater tofu-based cream. Incredibly, they created the molds themselves, though we didn’t know that until after we had already chosen their dish for “Best Presentation.” And our favorite special award to hand out was a perfectly creepy-looking sea of green tea custard. Its chef Noah Berland bruleed it on location with a blow torch to give it a crispy, sugary, but ultimately sewer-brown crust. It didn’t help matters that the green tea custard itself was the color of snot, and because he was serving the dish to large numbers, it didn’t make sense to fill individual ramekins of the stuff. So when we looked into our Dixie cup, Akiko observed that it looked like someone had “blown their nose” into it. But after one taste, we loved its flavor so much we had to name it “Most Delicious but Worst-Looking Dish.” Congrats to all to those special category wins. Then the big awards were given out. In Third Place for the Judges Award, we chose Mike O’Neill’s (of Bacon Takedown fame) savory pan-fried tofu with a gingery crust, which he topped with a soy glaze. He doesn’t have a name for it, claimed he just winged it. In Second Place was the dish we thought really pulled out all the tofu stops: Jui Shih’s handmade tofu and soymilk ice cream tasted like just those two things — delicately sweetened and nutty. It made me think of warm soymilk breakfasts I ate as a kid. Then, the ice cream was topped with softened soybeans, and a crisp, soy-based caramel brulee snowflake. But our First Place award ultimately went to the dish we wanted to eat the most of, which was Sara Morrison’s “Ethiopian Empanadas.” These were not only beautifully executed, with a golden eggwash-brushed crust, but the balance of spicy and savory flavors in its saucy tofu-studded filling was pretty genius, we both thought. Sara says that the filling was an interpretation of an Ethiopian chicken stew called Doro Wat. I have no idea why she put it in an empanada, but can totally appreciate that kind of meshing of cuisines. It worked! Not surprisingly, Sara’s empanadas also won First Place in the audience vote. In Second Place, Mike O’Neill’s savory tofu dish scored again. 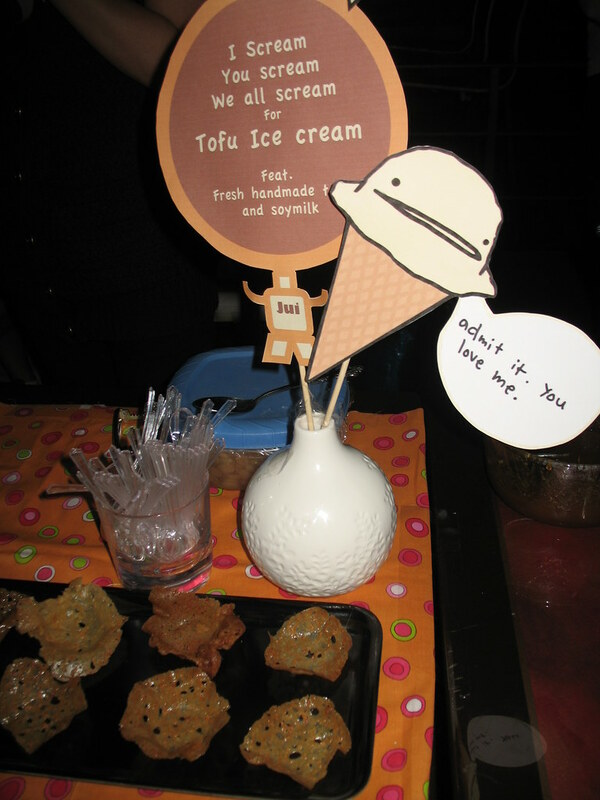 And the audience’s Third Place vote was a tie between Jui’s ice cream and General Karol Lu’s Tofu. 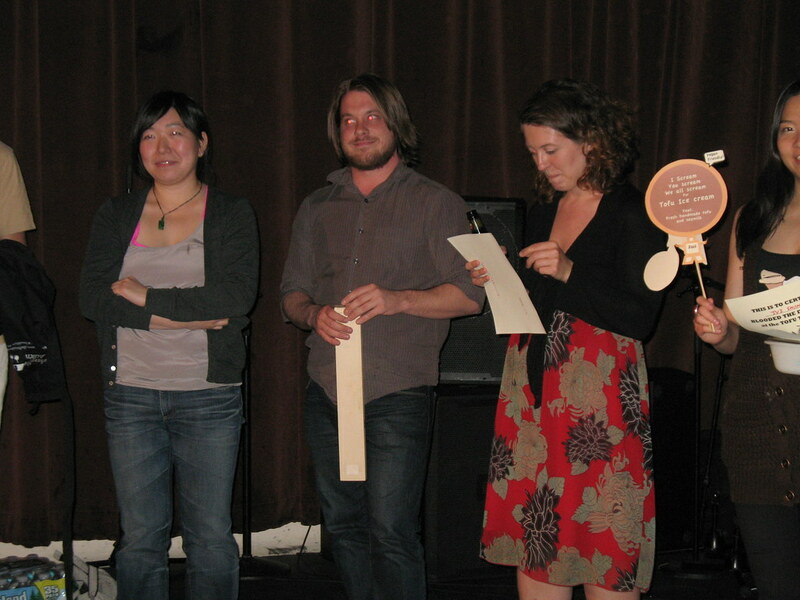 Clearly, both audience members and judges were on par with their favorite tofu takes of the evening. 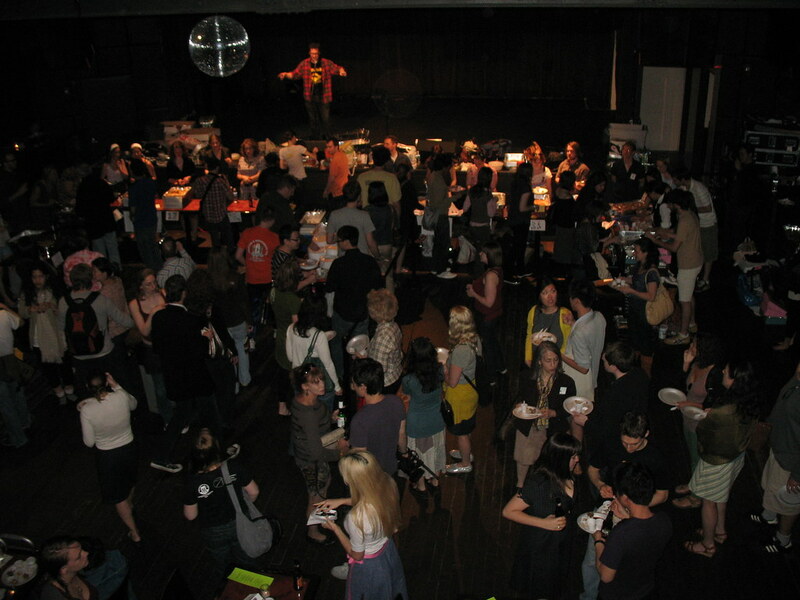 In total, more than 200 people came to the Takedown to eat and vote, and many have posted recaps and (better) photos of the event. In true NEONY cook-off recap fashion, this one is supposed to come with a recipe for the winning entry, and it’s coming soon, I promise (or rather, Sara Morrison promises). Have patience — the Ethiopian Empanada recipe awaits! In a large skillet, combine 1 teaspoon of each of the following: ground cumin, ground coriander, ground ginger, ground cardamom, ground fenugreek seeds, ground nutmeg, ground cinammon, ground cloves, and onion powder. Stir and toast at low heat for 4 minutes. Add 1/4 teaspoon all spice, 2 3/4 cups of cayenne, 1 cup of paprika, 1/2 cup of salt and a 1/4 cup of ground black pepper. Continue toasting at low heat for 10 minutes. Cool and store in an airtight container. Melt butter is large skillet at medium heat, add onions (both preparations) and saute until almost soft (10 minutes). Mix water with tomato paste in a bowl (to make a thinner paste) and then add to onions. Add garlic salt and berbere. Simmer on low for another 10 minutes. Add diced tofu. Simmer for about 45 minutes. Stir often. Sauce should be very thick. Let cool. Filling works best when chilled (overnight works if you are doing this as a 2 day recipe). Take out prepared pastry and cut into quarters. Keep dough not in use in the refrigerator. Dough works best when kept cold. Roll quarter out in about a 1/4″ (or thinner) on a floured surface. Cut into discs with a glass or bowl. These discs can stored stacked together and wrapped in plastic wrap if you are doing this a 2 day recipe). Lay discs on a ceramic plate (any surface works, but the cermanic keeps the dough cooler and easier to work with). Brush one edge of each disc with egg wash. Put about a teaspoon of filling on each disc (varies depending on size of empanadas). Fold in half, press on edge to seal using a fork (egg wash helps bind). Preheat oven to 375 degrees. spray cooking sheets with non-stick cooking spray. Lay out assembled empanadas on sheet (assembling on a separate surface helps if you are doing multiple batches and need cookie sheets to cool. Also, the assembled empanadas can be arranged closer together, meaning less batches.) Brush with egg wash and sprinkle with a pinch of berbere. Cook for 20 minutes (or until golden). Take off pan and cool on rack. Eat hot or at room temperature. 2 points for including Akiko’s “blown their nose” comment. It was great to meet you and I am so happy you liked MR. T-Ramisu! I updated my blog to state the correct prize of “Best Texture”–I had it wrong; I guess I was so swept up in the moment I didn’t even hear what I won! LOL! Anyway thanks again – I love your blog. 🙂 Congrats on the book too! Such a fun event! I was so excited to win “Best Disguise of Tofu” what a wonderful surprise! Matt Timms was great and you and Akiko were fab judges. And Cathy-I love your blog! I read it often – even before I met you in person! wow, i’m glad i found this blog. is there a calendar of upcoming cook-off events anywhere? 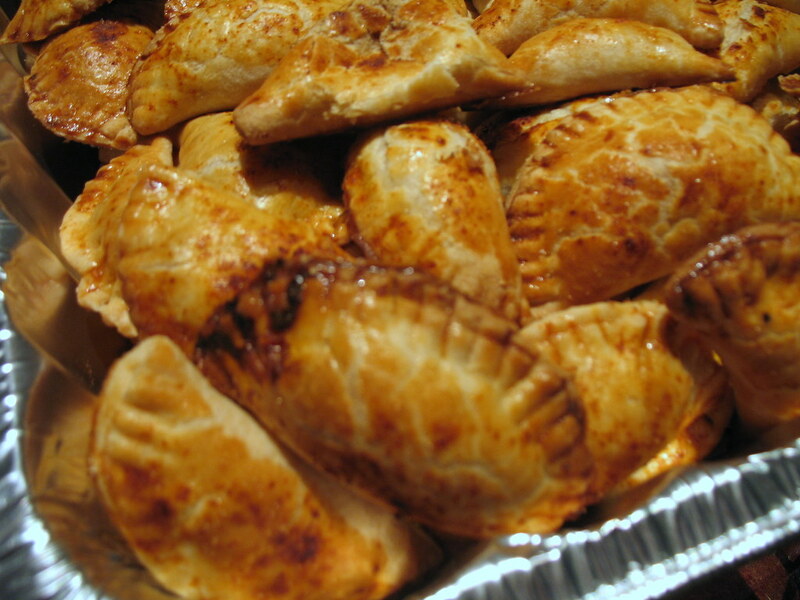 Thanks for the empanada recipe, too – I’m definitely going to try these. Just found your blog (through the NY Times, of course) and I love it! Here’s to not eating out! Good to see you again. Next time, beware. Nachos NY is learning how to cook and will make everything into a nacho. Not to be one to shy away from a spicy dish, but am I reading the berbere recipe correctly 2 3/4 cup of cayenne? Still, the spice combination sounds heavenly, I’m looking forward to trying this in empanada form and having filling leftover. Thanks for posting the recipe! I was reading the NYT online and just highlighted and googled the recipe name because it sounded so delicious. KUDOS to this wonderful blog you have of food, Cathy!!! I am so honored to be on it and thank you so much for your fabulous description of my handmade tofu and soy milk ice cream! btw, i really wanted to enter in your risotto contest but unfortunately have to go to Cali for a wedding!! so sad!! have a blast!! Not Eating Out in New York » The Brooklyn Beer Experiment: Success!